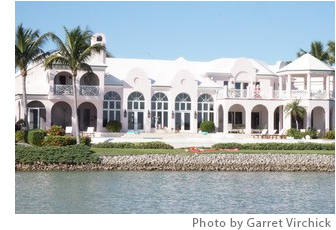 In property after property, royal palms sway over lawns that tumble into the bay. Every house has a yacht or an empty boat slip with a full crew awaiting the owner’s return, said Greg Dyer, the tour boat company’s assistant operations director. One homeowner pays nearly $600,000 a year in property taxes. No wonder Naples has such great bike paths. What most amazes Dyer is that many wealthy property owners “don’t actually live down here” – the houses are investments. Others inhabit their mansions only a week or two a year, he said. Local residents include Judge Judy Sheindlin, Taco Bell’s and Best Buy’s CEOs, the billionaire owner of the Jacksonville Jaguars, bestselling author Janet Evanovich, and a few hedge fund managers. 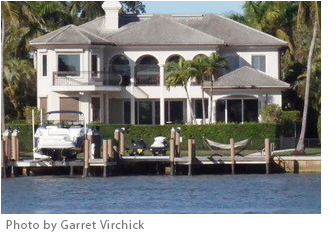 And Naples is only the 15th-richest zip code in America, according to Bloomberg. It doesn’t hold a candle to the top-ranked Fischer Island in Miami and the high-tech enclave of Atherton, Calif., south of San Francisco. It’s hard for most of us to imagine. This is sheer pleasure and real taste of one’s lifestyle. It shows money can buy you everything from a dream home to a luxurious yacht. But, it is where everyone fails to understand that they buy luxury to augment their wealth, not to satisfy themselves. I admire the 1%. I assume they’re smarter than me and have likely worked harder than me. They fully deserve their rank. But this – “They have tripled their share of the nation’s total wealth to 21 percent since the 1970s.” – is a problem, and the trajectory cannot be sustained if we want a balanced economy. I do not expect my libertarian friends to support redistribution as a solution, but I do expect them to recognize the problem. I agree with Ken Pidcock. In prior centuries, you could entertain in-person for a few coins per head, or make a few pots to sell, or raise and sell some grain, etc. Now your creations might be sold to billions of people, so a few coins per head may yield astronomical amounts of money. A possible partial remedy to the resulting inequality might be to broaden stock ownership. Securities regulation, low-cost broadly-diversified mutual funds, and IRAs/401(k)s make it possible for more to join the middle class. Other partial remedies include investments in such infrastructure as communication, education, health, research, transportation, etc. People thinking they will become part of the 1% or even the top 14% are steeply ignorant. That is a dream the 1% want you to think. Go ahead, admire them while your mired in general income. To really know what is what, you would have to know the full background of what they have and how that came about. Absent that, adulation of these people is dumb. Oh yes I have many investments but not that amount nor kind. The 1% are laughing up their sleeves while the dumbest think they will attain the same rank. You think you will get to the 1%? Odds are 99% against it. Thanks for publishing this, and please do more like it. It raises lots of questions important for both pre- and post-retirees. For example, how does the mindset of “it’s-ok-to-be-rich-I-might-be-there-one-day-too” get set in the mind? Why is something so obviously false so widely believed? I’m sure your staff can think of many other issues raised by such beliefs.